Many readers, like myself, will not have realized how influenced they have been by Nietzsche’s cynical view of power until they read Crouch’s compelling case for a much more hopeful perspective. Later in the book the author helpfully (very!) differentiates power from privilege, dynamics I’ve made crudely analogous in the past. This is a somewhat common topic in our church; I’m convinced that white privilege is the achilles heel of most multi-ethnic churches. 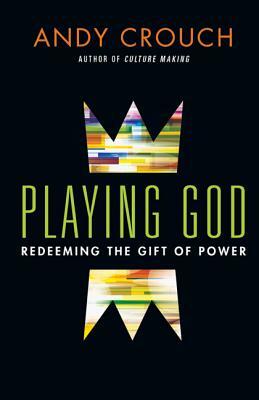 Playing God, with it’s more hopeful view of power, gives me more nuanced ways of pointing out the destructive traits of privilege while making space for the positive uses of power that are worth moving toward. Institutions are the way the teeming abundance of human creativity and culture are handed on to future generations. So posterity, not just prosperity, is the promise of GOd to Abraham: countless descendants and blessings poured out on entire nations not yet born. Posterity, not just prosperity, is God’s promise to David, a succession of sons in his line on the throne. And posterity was what the average Israelite prayed for as well – “may you see your children’s children!” – a wish that before death one would see the evidence that shalom and abundance would continue in one’s own line after death. There is nothing quick about shalom. True shalom endures. Playing God has much to commend it, far more than the few examples I’ve pointed to here. It also raised a few questions for me. As much as I appreciated the hope about power that spills from the pages of this book, I couldn’t help wondering about how optimistic the author is. OK, optimism probably isn’t the best word and Crouch does a great job of outlining the abuses of power with personal stories and cultural observations. But still, from where I stand, and despite the compelling case made by Crouch, it’s hard to share his hope about power. In the structures and systems of our city, power’s evil offspring (Crouch very helpfully identifies these as injustice and idolatry) simply seem to morph from one form to another over time. The results are generations of disenfranchisement, violence, and oppression. Not only these of course; there are always instances and communities of goodness and beauty. And yes, there are many, many people and churches using their power to create space for flourishing. But these individuals and institutions always seem, sometimes quite literally, outgunned by other sources of power. I wonder too about the way Crouch talks about the distinction between evangelism and justice. While strongly affirming the need for both, he makes the same move other evangelical-ish folks do. He writes, “In short, working for justice is cool. Proclaiming the gospel is not.” This, I think, is quite incorrect. Many of the examples Crouch gives about justice work take place outside the USA. They are wonderful examples of the sort many Christians (these days, at least) strongly support. But the notion that justice is cooler or more acceptable than evangelism seems to expose a narrow (or geographically distant) view of justice. When I think of justice for many of my neighbors I think of changes to policy – education funding, gun control, law enforcement, economic development, drug policy – along with robust acknowledgment of and response to historic injustices that would be far from popular or cool with the majority of those holding the bulk of our culture’s power. But these are mostly quibbles and I’m reading Playing God from my own biased location. I hope many will read this book, that it will start many conversations, and, best of all, call churches to steward the power promised us by God’s presence for the flourishing of all our neighbors. Thanks David for this very realistic review. I am reminded of the Robert Greenleaf Center for Servant Leadership. I think that one can say that Robert Greenleaf was/ is doing evangelism with his work on servant leadership. But, I am afraid that many, maybe most, people would not think of it this way. Greenleaf began developing his ideas about servant leadership while working at AT&T in New York City. “Greenleaf contributed mightily to AT&T during his 38-year career there: Director of Management Development, originator of the world’s first corporate assessment center, promotion of the first females and Blacks to non-menial positions, a program to expose up-and-coming leaders to the humanities, even bringing in famous theologians and psychologists to speak about the wider implications of corporate decisions. Greenleaf retired in 1964 and began his second—and most productive—career as a writer, consultant, and teacher.